Abba Moving, LLC guarantees on-time pick-up and delivery. Whether your destination is Florida, California, or New York we’re proud to offer the best possible service at an affordable price. We will ensure the safety and care of your belongings, so you can concentrate on a new beginning. For any questions you may have regarding the preparation of your long distance move and storage, please call us at any time at 1-866-484-MOVE (6683). We want to help you get an accurate estimate so there are no surprises on your move day. 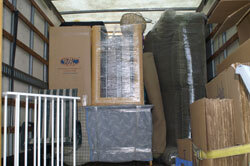 Abba Moving, LLC has a state of the art facility located in Windsor, MD. The facility is protected from fire and theft. Our heated warehouse is only accessible to customers accompanied by Abba Moving, LLC personnel. This results in the safest storage possible for your possessions. If you need to be out of your place today, but can’t get into your new home until tomorrow, this may be the OPTION for you. Abba Moving, LLC moving service can pick up your items one day, keep them on the truck over night, and then deliver them the next morning to your new home.